A new Washington Post poll of Republicans records the remarkable extent to which today's rank-and-file GOPers can't identify much in the way of any clear-cut Republican leaders. Having just read Sam Tanenhaus' meditation on Sarah Palin in the New Yorker, I'm beginning to wonder whether the leaderless nature of the GOP represents a temporary vacuum or something a little more profound. To judge from [Palin's] book, the most exciting time in her life was the election of 2008, when she was embraced by the army of “everyday, hardworking Americans,” the “everyday folks,” and “thousands of regular Americans coming out with their signs” who mobbed her tumultuous rallies, thrilling to her odes to the “true America.” She gave them a “magnifying mirror.” They reflected her own image back to her. This adoration is kept alive today by the excited autograph-seekers in Grand Rapids and Fort Wayne, in the audience that gave Oprah Winfrey her best ratings in two years, and in the various advocacy groups that have sprung up to promote Palin for the Presidency: Conservatives 4 Palin, Team Sarah, Vets 4 Sarah, 2012 Draft Sarah Committee, Sarah Palin Radio, SarahPAC. The true meaning of Palinism is Sarah Palin—nothing more and nothing less. She is a party unto herself. Now it's hardly novel to observe that the excitement Palin has aroused among (particularly) cultural conservative activists reflects how closely she resembles them, or that her fans celebrate her lack of conventional credentials or policy knowledge as a badge of honor. But it may also reflect a genuine leadership crisis in the conservative movement and the GOP, wherein no one who is not a Palin-style "mirror" of grassroots qualities can be trusted. It's not enough to call this sentiment "populist." Historically, most "populist" leaders have represented a preexisting ideological set of beliefs in one or both major political parties, and a relatively specific set of policy goals. Yes, populists like Tom Watson (with his dirt-farmer persona) and William Jennings Bryan (with an idiom derived largely from the Bible) derived some of their appeal from personal identification with the lives and values of people who felt disenfranchised. But they were also genuine leaders who pulled their followers along to positions on policy matters and political loyalties they might not have embraced on their own. The history of "right-wing populism" in this country is murkier and more controversial. But by and large, the conservative populist impulse has been one that relatively conventional Republican politicians (notably Nixon and Reagan) or regional reactionaries (George Wallace) have exploited in the pursuit of conventionally conservative ends. 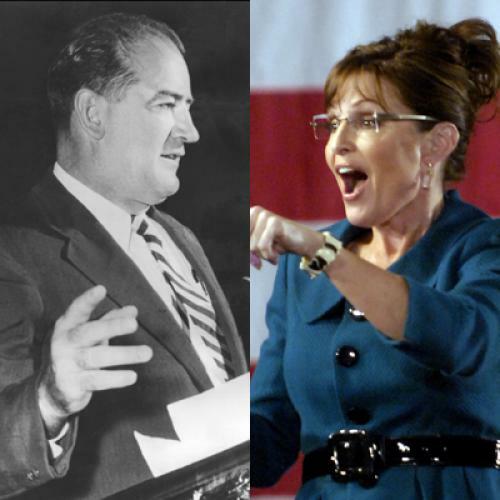 Palin strikes me as more like another famous conservative "populist," Joseph R. McCarthy. And I don't say that in order to invoke an invidious identification of the overall political dangers represented by St. Joan of the Tundra and the famously irresponsible red-hunter. What strikes me as similar is the extent to which both politicians were relatively ordinary people who were suddenly swept into vast celebrity by an almost accidental association with grievances poorly advocated by conventional political leaders. McCarthy stumbled upon the power of many years of accumulated unhappiness--mostly among heartland conservatives, but elsewhere as well--with a bipartisan foreign policy led by northeastern elites that aligned the United States with what many considered historic national enemies--not just the Soviet Union, but "Europe" generally, and for many Irish-Americans, the United Kingdom. It's sometimes forgotten that many of McCarthy's red-hunting conservative allies fulminated against the "loss" of China and the "betrayal" of Korea because they deeply resented a Euro-centric foreign policy, as reflected in their general opposition to the establishment of NATO. At a deeper level, many of McCarthy's supporters (particularly in the midwest) were the very people who were initially opposed to war with Nazi Germany, on the theory that Hitler represented a Western bulwark against Bolshevism; even those who didn't feel we backed the wrong side in Europe often thought we should have negotiated an armistice with Germany that would have avoided the Soviet conquest of Eastern Europe (an argument still advanced by Pat Buchanan). The eventual consolidation of conservatives in favor of an aggressively internationalist anti-communism was a later development, but it's obscured the isolationist roots of the McCarthy uprising. McCarthy eventually came to grief, of course, in part because of his sloppy and reckless tactics, but more immediately because he extended his attacks on Democratic foreign policy "betrayals" to attacks on the Eisenhower administration and even the Army. And thus the leadership class of the Republican Party came together to crush the fiery Wisconsinite, even as they sought to coopt his appeal by their own anticommunist fervor. Like McCarthy, Palin is appealing to a variety of unredeemed cultural and political discontents, and like McCarthy, she's gradually extended her liberal-baiting into attacks on conventional Republican pols, most notably the people surrounding the very presidential campaign that made her a celebrity. Unlike McCarthy, however, she's not taking on a highly popular and newly elected Republican president, but a defeated GOP establishment that millions of conservative activists believe betrayed them through "big government" initiatives, excessive bipartisanship, and the failure to successfully execute a counter-revolution against legalized abortion, legitimized homosexuality, and other forms of cultural pluralism and diversity (or as they would say, "relativism."). Moreover, said establishment has also been terribly weakened by its association with economic calamity, caused, so thinks the conservative "base," by the reward-the-crooks-and-welfare-loafers "big government" betrayals of the autumn of 2008. This doesn't mean that Palin is destined to fill the leadership vacuum in the Republican Party. Like Joe McCarthy, she's more suited to act as a vehicle for discontent than as the agent for its vindication. But make no mistake, the contemporary dynamics of the Republican Party and the conservative movement make it very unlikely that anyone from that quarter will curb her as Ike and his allies curbed and then broke McCarthy. If and when Palin succeeds again in creating a national public policy furor via a casual Facebook post, as she did with the famous "death panel" screed (arguably as irresponsible as anything Joe McCarthy said), it's more likely that Republicans will coopt her than repudiate her. So while Sarah Palin probably won't become the leader of the GOP, she may well play a major role in setting the terms on which anyone else can command the leaderless masses she represents.